Best hostel with the best vibe. Making sure you really enjoy your stay. If you are looking a place to chill and enjoy good people and music. Also the breakfast at 10am is the best I had in Morocco. I stayed an extra night and hard time to leave. Thanks for everything! Best hostel I’ve ever stayed in! The location is perfect, the atmosphere is great and the staff is wonderful. I couldn’t think of anything negative to say about it if I tried. Definitely 10/10! This hostel was great. The staff was helpful and friendly. They organise a lot of activities. Breakfast is RECOMMENDED! The location is perfect, yea it's difficult to find but it's perfect anyways. I would definitely go again! The Chill art really is, a chill place to be. A bit difficult to find, narrow way from the zouk..but all difficult roads lead eventually to Paradise! 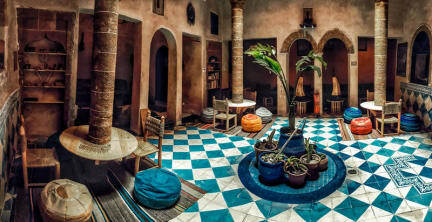 Really loved Essaouira and this hostel. Great atmosphere amd the common room looked very ‘chill’. There was always some music playing, which was nice. 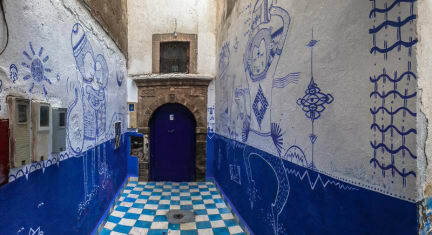 Location was excellent, right next to the main street in the medina, and also close to the beach. Showers were a bit cold, but this was not a huge problem. The hostel itself was great. Kind personel, very clean rooms and brand new showers (actually everything was brand new)! The alley to reach the hostel is hard to find when getting there for the first time. It’s also a bit creepy. Nevertheless a great hostel and you will enjoy your stay! Great hostel, nice location, a lot of cats everywhere inside though so it questioned the cleanliness. Unfortunately the wifi had quite some problems during our stay.